The Global Positioning System 2R-11 satellite, built by Lockheed martin, will replace an older craft in the U.S. military's navigation network. As the 50th Global Positioning System satellite rose to space Saturday, it celebrated the man who championed the concept of orbiting spacecraft serving as "lighthouses in the sky" to guide mankind with precision navigation information. The late Dr. Ivan A. Getting, credited as the visionary behind GPS and the founding president of The Aerospace Corporation, passed away last October at the age of 91. "Dr. Getting was one of the founding fathers of GPS over 30 years ago. He envisioned GPS and worked tirelessly to make it a reality," said Jerry Heydinger, Air Force program manager for the GPS space and control segment. GPS satellites send continuous navigation signals that allow users around the world to pinpoint their position and determine time. The signals are so accurate that time can be figured to less than a millionth of a second, velocity to within a fraction of a mile per hour and location to within a few feet. 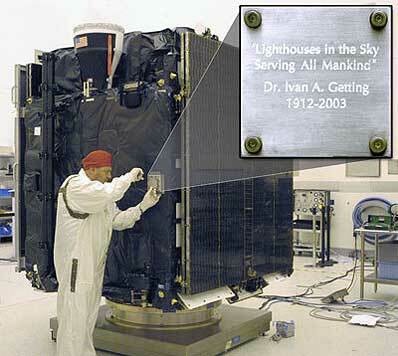 In a lasting tribute that will circle 11,000 miles above the planet, a famous quote by Getting, "Lighthouses in the Sky, Serving All Mankind," was inscribed on the GPS 2R-11 spacecraft. The quote, along with Getting's name and the years of his birth and death were carved into a one-tenth-of-a-pound "trim weight" used on the satellite. Once the commemoration idea originated within Aerospace Corporation and the Space and Missile Systems Center at Los Angeles Air Force Base, it quickly gained momentum. "It was obviously a good choice. Dr. Getting was truly a pioneer in the space and GPS worlds," Heydinger said. "He not only laid the groundwork for GPS, but left his imprint on many other highly successful defense and technology programs integral to our national security and well being," added Dr. William F. Ballhaus Jr., president and Chief Executive Officer of The Aerospace Corporation. The GPS 2R-11 satellite was successfully launched at 12:53 p.m. EST (1753 GMT) Saturday from Cape Canaveral, Florida. Riding atop a three-stage Boeing Delta 2 rocket, the craft was delivered into a temporary elliptical orbit stretching from 100 miles above Earth at the closest spot to nearly 11,000 miles at apogee. In the coming days, the craft will use its kick motor to circularize the orbit at 11,000 miles and join the GPS constellation where it will replace the ailing GPS 2A-19 satellite. "(This) launch is important for ensuring that the GPS system remains robust in its mission of providing precise positioning and time information to military and civilian users around the globe," said Lt. Col. Michael Mason, Air Force Space Command's lead for operations and sustainment of the navigation satellite system. The fresh satellite is replacing GPS 2A-19 because the 11-year-old spacecraft has a suspect Navigation Data Unit. "Failure (of GPS 2A-19) is not imminent," Mason said, noting that the satellite will continue to be used as a spare. "But this (launch) in an important step to make sure we maintain the robustness of the constellation." Built by Lockheed Martin, the $45 million GPS 2R-11 satellite will fill the Plane C, Slot 3 position in the GPS network. "The 50th GPS mission is a major program milestone and we look forward to achieving a successful on-orbit checkout to quickly place the satellite's advanced navigational capabilities into operational service," said Dave Podlesney, Lockheed Martin's GPS 2R program director. "It's our fervent hope and prayer that this GPS spacecraft will serve to guide soldiers, sailors, airmen and marines to their destinations and successful completion of their mission, and to their safe return home for years to come," said Lt. Col. Brad Broemmel, the Air Force launch director. "GPS capabilities have become a key enabler to the way we perform joint coalition warfighting," Mason said. "Today, it is impossible to envision putting young men and women into harm's way without the advantages that GPS brings to the battlefield. "That being said, GPS capabilities have also become a critical enabler for an untold number of civil applications, and the Air Force fully understands its responsibilities and takes its role as the steward of GPS for civil use very seriously." 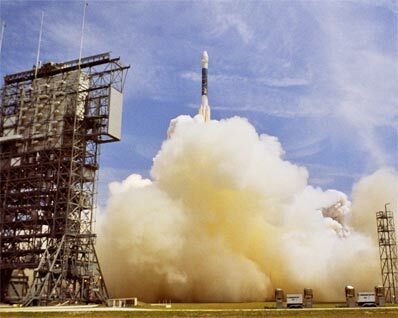 Twenty-six years ago, the first GPS satellite was launched aboard an Atlas booster from Vandenberg Air Force Base, California. Eleven of the so-called Block 1 GPS satellites were launched through 1985, although one liftoff failed, as the U.S. military tested the space-based navigation concept. 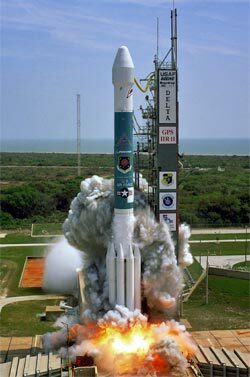 Today's operational GPS system began launching in February 1989 on Delta 2 rockets from the Cape. Nine Block 2, 19 Block 2A and 11 Block 2R spacecraft have launched with one failure. The next GPS is scheduled to go up July 20, followed by another in September.